We are so excited to spotlight Anna Todd, one of many Apollycon 2017 attending authors. If you haven't read any of her books, now is the time to pick her infamously favored series, After. I’m the most excited to meet the readers and hang out with all of the authors. I’ve never been to Apollycon before and I’m so, so excited and honored to even be invited! I can’t wait. Plus, it’s in Florida, so the weather should be great. The book I mentioned above :P During the first one, I cried a little, it was sad, but the second and third were even worse. I’ve been tortured by this author, but I’ve loved every second of it. I have so many amazing moments as an author. I still can’t believe that I’m even an author! I could have never imagined my life to turn out this way and I have to pinch myself at least once a week. If I had to choose, I would say that my favorite moments are when I hear from readers that my books have made them read more, or even write their own stories. There’s nothing better to me than my words somehow inspiring someone. My house. I just moved to Los Angeles from Austin and since the move, I’ve been traveling most of the time. Well, this whole year I’ve been traveling :P I love to travel and to meet so many amazing readers from around the world and I’m already filling up my schedule for next year, but I sort of forgot how much I love quiet nights in. My perfect night would be drinking wine with my husband and watching t.v. -Goes live October 10th, ends Feb 1st, 2017. My favorite part about book events is getting to meet the authors that I love! It's a new to me author! 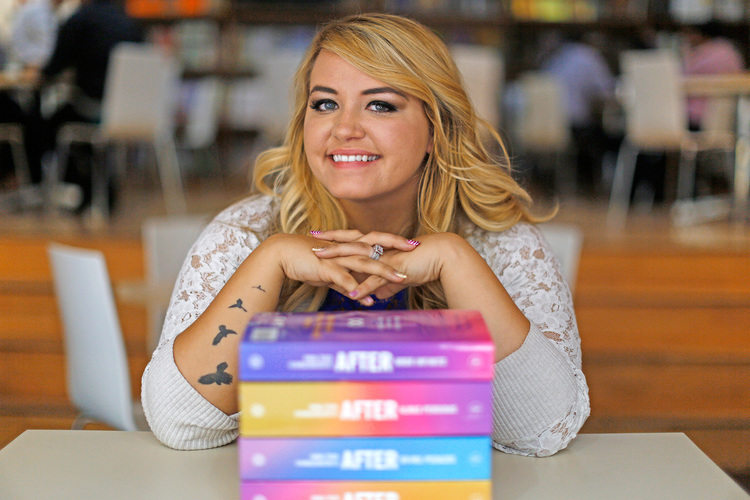 I am so excited to meet Anna Todd. I fell in love with her After series this past spring, so much that I got a tattoo for it! I can't wait to meet her and share the tattoo with her! Author is new but excited to read her books!